"What this Nice-born Parisian teases out of his accordion is something the likes of which world has never heard before. The great French accordion tradition, from Galliano to Matinier, shines through, but he takes it further with a new, characteristic expressiveness. It is a future virtuoso that is playing here!" says the Süddeutsche Zeitung newspaper. 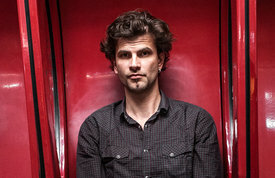 The French accordionist, vocalist and composer Vincent Peirani was born in Nice on 24.4.1980. He started playing the accordion at the age of eleven. One year later he began taking lessons in classical music for clarinet and accordion at the "Conservatoire National de Région" in Nice, and it didn't take long for his gift to start showing.